Always be mindful of who you're bashing. Complaining about a sports team sometimes has unfortunate repercussions. 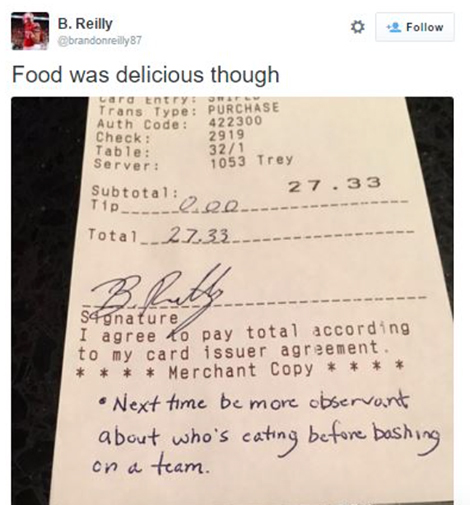 Case in point: what happened when University of Nebraska wide receiver Brandon Reilly was enjoying a meal out when his waiter allegedly starting trashed his team, the Cornhuskers. Reilly decided to teach his waiter a lesson. Upon receiving the bill, Reilly felt compelled to stiff his waiter of a tip. Although Reilly eventually deleted the photo from his Twitter, he still stands by what he did. Social media these days For all those tweeting opinions, don’t be quick to judge when you don’t know many details. Reilly isn’t the first to skim a waiter on behalf of “inappropriate” behavior. Last month, a waitress was left without a tip after blatantly flirting with a man in front of his wife.